Looking for low carb tacos? These Zucchini Filled Low Carb Tacos are the perfect option when you are eating low carb but craving tacos. While low on carbs and full on flavor these zucchini filled tacos are just what you need for dinner tonight. Start by dicing your onion, red pepper, and jalapenos. Next cut the end off of each zucchini and slice 1/4 of the front off, long ways. Brown your turkey burger, and add in diced vegetables, pepper, garlic, and onion powder. Stir on medium heat until warm. 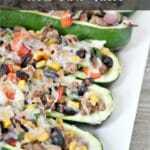 Spoon mixture into each zucchini. Place "boats" into a baking dish and cover with foil. Remove foil, and add shredded cheese to each boat.